One of R’s favourite activities is a really simple one. Our living room has patio doors in it leading out into the garden. I got some foam shapes – I bought these ones from Hobbycraft, but you could easily get some foam sheets and cut your own shapes out – and gave her a little tub of water and a paintbrush. I had to show her a couple of times how it worked – she couldn’t quite understand initially that she had to put the foam shapes onto the wet bits of window that she had already painted – but she got the hang of it quickly and it keeps her busy for ages. I think this is a particularly good wet weather activity – R seems to really enjoy seeing the rain drip down on the other side of the window as the water runs down on her side too. 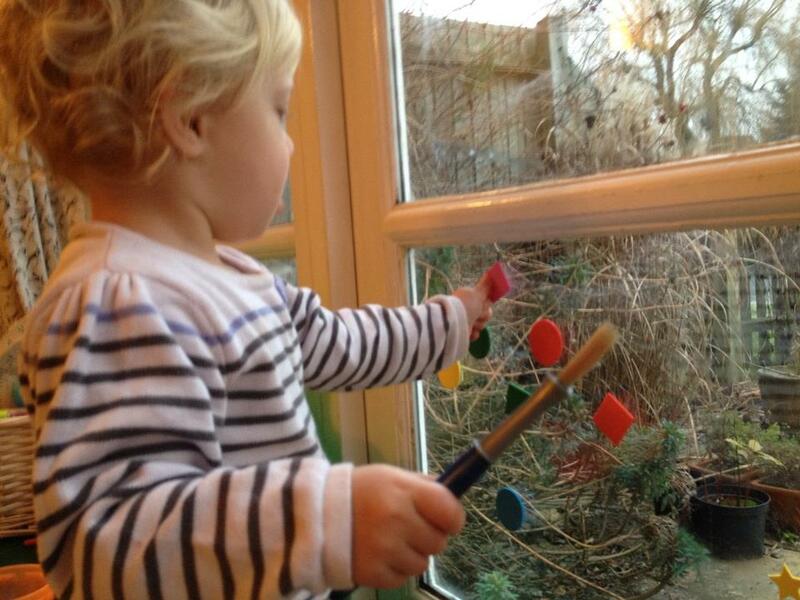 This entry was posted in arts and crafts and tagged foam, foam shapes, Hobbycraft, raining, toddler, window. Bookmark the permalink. What a cool idea! We’ve got a bunch of that foam hanging around. Defo going to try this! It would be fun to try it with shapes you cut out yourself, I think – I’m going to get some foam sheets and give it a go in the next week or so. Or for older kids, get them to cut them out and extend the activity by at least 15 minutes! Hello there! Thanks for stopping by my blog. Your foam shapes idea is brilliant. We have a load of foam letters that the kids play with in the bath – they stick to the tiles in the same way. Hours of fun! Yes, we have foam letters for the bath too which she loves. We also just got bath crayons, they are a huge hit.